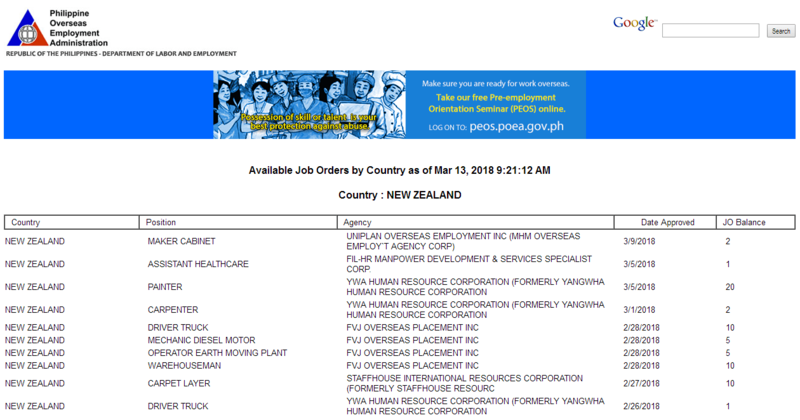 There are more than 2000+ New Zealand jobs for Filipinos that are posted by the official website of Philippine Overseas Employment Administration (POEA). Licensed recruitment agencies are not allowed to charge recruitment or placement fees from workers deployed to countries that prohibits collection of such fees. To note, most of the jobs available in New Zealand include carpenters, painters, plasterers, bricklayers, block-layers, masons, electricians, welders, fabricators, plasterers and other construction workers. Those who shall violate the “no placement fee” policy, the POEA said, are set to be held liable for violating recruitment laws. Aside from New Zealand, other countries that have prohibition on collection of placement fees are United States of America (H2B visa), Canada, United Kingdom, Ireland, and the Netherlands. 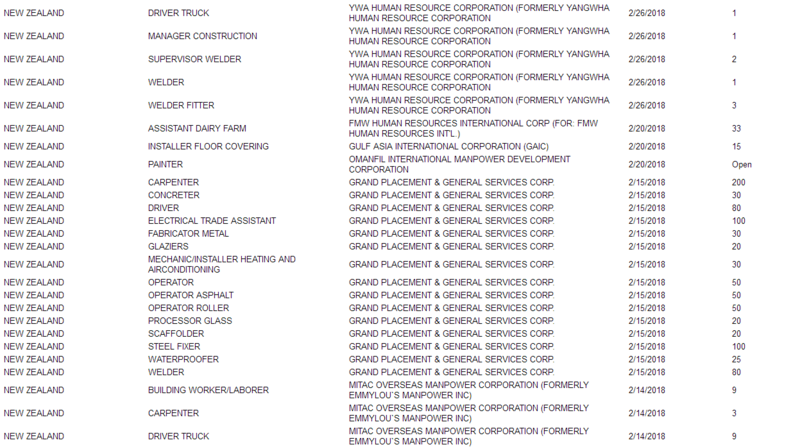 The staff of Government PH has compiled the available New Zealand jobs which can be viewed at POEA website. The lists are in order of the latest approved job posting. JO Balance in the rightmost part means the remaining job orders after deducting the number of workers whose documents were already submitted to POEA for processing. 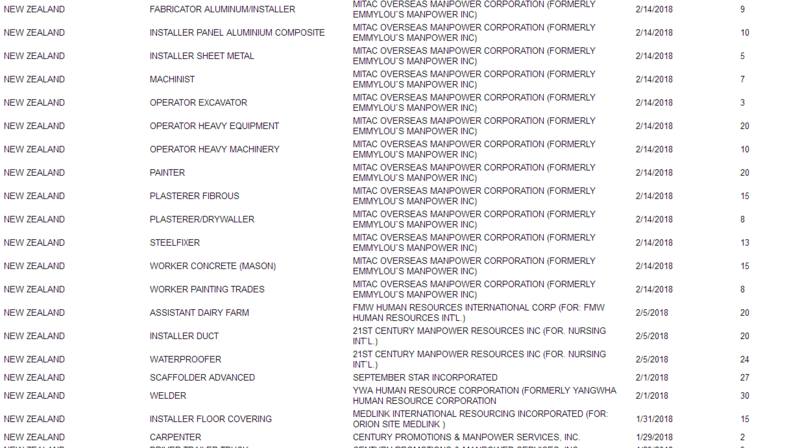 Basically, those are the number of available jobs in the specific agency as of March 13. The job orders are considered active unless canceled by the employer or recruitment agency. However, we cannot guarantee that the job vacancies are still open because the recruitment agencies may at present have already accepted qualified applicants for the listed positions. IMPORTANT: VERIFY WITH THE AGENCY IF THE JOB ORDER IS STILL ACTIVE OR NOT. The phone numbers, websites and email address of different agencies with POEA license are listed below. You can directly contact the agency and send you applicationn letter and resume. Hi can apply a job in new zealand even though am here in dubai?? Yes. 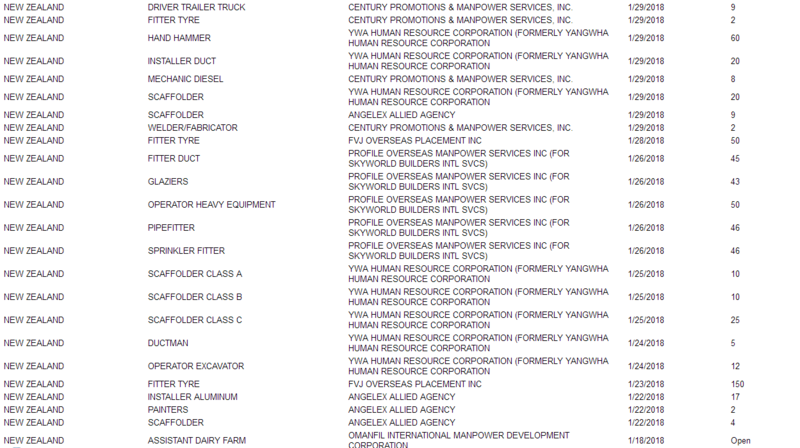 Just contact directly the agencies listed in our article. Hi can apply ajob opening in new Zealand. Yes, you can apply directly to the POEA Accredited agencies. is there a JOB ORDER IN CANADA? Stay tune with our site. We will post job openings in Canada. Hi, I just want to ask how to apply job in new as a factory worker or house keeping. Thanks.